When it comes to making a purchase while shopping online, something as simple as a coupon or promo code can impact a customer’s decision-making process. In fact, many online consumers conduct searches to find discount codes on sites like Retailmenot.com or Coupons.com prior to completing their purchase. That being said, a new browser extension from Couponfollow.com aims to shake up the online savings industry, and merchants can use it to their advantage. 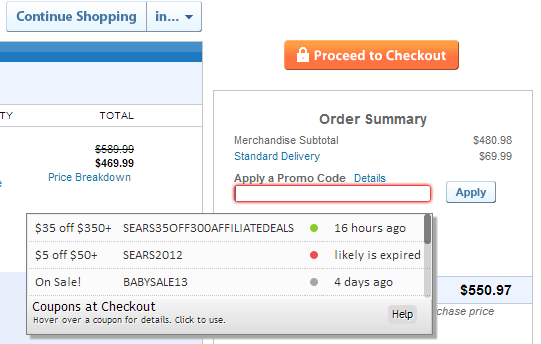 The Coupons at Checkout extension for the Chrome browser automatically displays relevant discount codes when a customer is ready to complete their checkout. Not only is this tool valuable for customers looking to save a little money, but it also has the potential to influence customers to make a purchase when they are hesitant. It is important to note that the extension is backed by CouponFollow.com’s database of coupons, and merchants who want to ensure that their promotions are displayed by the tool can submit their promotional codes either on the CouponFollow website or to the company via Twitter. Moreover, CouponFollow provides additional tools for merchants, including the ability to monitor each coupon’s influencers.